Located in the US Bank Plaza, right in the heart of downtown Boise and just blocks from the Ada County Courthouse, the Capitol Mall, and the US Federal Building, M&M Court Reporting Service has immediate access to any deposition site. Need a site? No problem! With on-site conferencing facilities and video conferencing, the latest in deposition technology, and competent, experienced reporters, staff, and business contacts, M&M can handle all of your deposition needs! Visiting us? Use our complimentary valet parking on the Main Street side of the US Bank Plaza, far right lane, just past Eighth Street, at the little Valet Hut. We gladly validate. This year in April again! Our 5th-floor location in the US Bank Plaza in downtown Boise allows M&M to provide comfort and efficiency, while our reporters provide all of the expertise and experience necessary for a pleasant and productive deposition experience. Videographers and translators are readily available, as well as temporary secretarial services. Lodging is available in several nearby facilities, while Boise's fine eating establishments provide a variety of cuisine choices to please any palate. M&M Reporting is proud to employ the largest number of court reporters in the state, all of which are qualified, experienced, and respected members of the legal community. 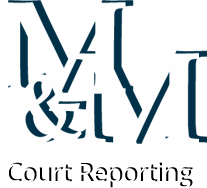 Federal and state courts look to M&M to fill court reporting needs in the Idaho court system, trusting in the dependability known to be demonstrated by M&M, and many current officialships are filled by former M&M court reporters. M&M's Boise location provides service to all of southern Idaho with facilities and reporters in Twin Falls, Pocatello, Idaho Falls, Nampa, Caldwell, and southeastern Oregon. Northern Idaho is covered by the Coeur d'Alene office. A wide range of services is available to assist you in your litigation efforts: Depositions, in standard, compressed, or ASCII formats; realtime depositions, with or without synchronized text; daily copy; Internet transcription. Additional litigation support includes document imaging, graphic design and reproduction; electronic presentation, customized software, and technical support in a variety of formats. Full-service video conferencing in our conference center.